By Douglas K. Outerhout, M.D. 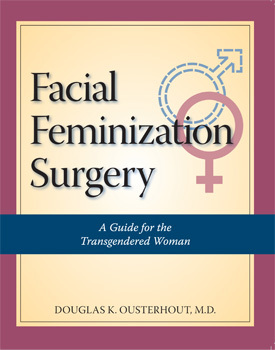 Are You Considering Facial Feminization Surgery? Do you have a prominent chin—a heavy brow—or a strong lower jaw that you feel detracts from your femininity? Would you like your appearance to more closely match the way you feel inside? If so, perhaps you’re considering plastic surgery. For many transgendered women, having their facial features refined has been an important step in their transition. Some individuals consider it the most essential part of their transformation. In Facial Feminization Surgery, Dr. Ousterhout also provides information on the recovery process for each procedure as well as side effects and, though unlikely, potential complications. This book covers procedures to rejuvenate the face, such as facelifts and eyelid lifts, and contains more than two hundred before-and-after photos of FFS patients. Allure.com article featuring Dr. Ousterhout.